Ask The Muscle Prof: How Can I Build Muscle Like A Beginner Again? After a brutal leg workout, you might imagine that your body will need a week to repair and regrow. Not so! If you want to keep growing for years to come, you need to rethink the way you approach workout frequency and volume. When I started training, I made huge gains in size and strength. Now nothing works. I hit every body part twice a week, blasting them with 20-30 sets per workout. Still no growth. What gives? I&apos;ll be honest with you: Plateaus are one of the most difficult things you will have to face as the number of years you&apos;ve trained continues to climb. As a scientist, I&apos;ve spent countless hours trying to figure out how we can avoid training plateaus. I&apos;ve also looked into the reasons untrained people grow quickly while highly trained people can barely make gains at all. It all has to do with how your body adapts to training. Once you know why you plateau, you&apos;ll be able to counter your body&apos;s adaptive impulse by strategically manipulating your training frequency and volume. Let&apos;s dive in! The primary model used to explain how we respond to the rigors of training is Hans Seyle&apos;s General Adaptation Syndrome. Originally, this theory explained how your body responds to stress in general, but over time we&apos;ve come to understand that hard-training athletes deserve their own version. 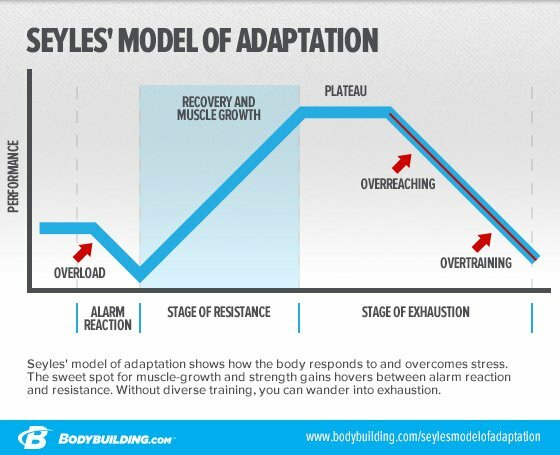 In either case, the theory posits that we move through three stages of adaptation: the alarm reaction phase; the resistance phase, and the exhaustion phase. The alarm reaction phase commences during training, when you break down muscle tissue with either heavy loads or high volume. After a workout, your body is pretty beat up, and as a result your performance declines for a short time. At this point, the stage of resistance is triggered. During the resistance stage, your body adapts specifically to the stimulus you imposed on it during the alarm reaction phase. If you lifted heavy, for example, the body adapts to make you stronger. If you trained for hypertrophy, your muscles will grow. Ideally, we fluctuate between the first two stages. When we stop making gains or plateau, we have officially entered into the stage of exhaustion. There are three likely reasons for this plateau. One is a lack of variation in training itself. This makes it impossible to enter into the alarm reaction phase because your body is too familiar with the training stimulus. Another reason you might be lingering in the exhaustion stage is that you have overreached and may possibly slide into overtraining. However, if you challenge yourself with new workouts, eat and sleep well, and train each body part twice per week, it&apos;s unlikely that these factors are causing your training plateau. More than likely, the culprit for your plateaued gains is that your training frequency is simply too low. I know what you&apos;re saying: "Two brutal workouts isn&apos;t enough? It&apos;s what Arnold used to do—and it feels like a ton!" Hear me out. From a scientific standpoint, the stage of resistance manifests as an increase in protein synthesis within the muscle. This may not surprise you. What might be surprising is that this increase is influenced by more than just how hard you train or how much protein is in your shaker bottle. Your training status has a lot to do with it, too. If you want to grow like you did back in the early days, you&apos;ll have to find a way to get the most of the short window you experience now. In a fairly recent study out of McMaster University in Canada, scientists had untrained individuals perform an intense leg workout, after which they analyzed the protein synthesis that took place in their bodies.1 These researchers found that protein synthesis lasted for 72 hours after the bout. Great, huh? The good times didn&apos;t last forever, though. After only 8 weeks of training, the window of elevated protein synthesis had shrunk to as little as 16 hours! This means the stage of resistance wouldn&apos;t even last to the end of the day if the person trained in the early morning. If someone has been training for three or more years, the response may be even briefer, along the lines of 4-12 hours. If that&apos;s you, then training a body part twice a week for months on end isn&apos;t likely to bust you out of your rut and deliver new gains. If you want to grow like you did back in the early days, you&apos;ll have to find a way to get the most of the short window you experience now. What if I told you the answer to busting through sticking points was to train each body part up to six days per week? To many, this would be a reason to label me a lunatic or question my nattyness. Surely, this type of frequency would make you overtrain in a hurry, right? Not necessarily. Here&apos;s what you need to know: Training frequency, which is how often you train, is independent from volume, which the measure of how many sets you perform per workout. So if you currently perform 15 sets per body part in a workout, I wouldn&apos;t have you perform those 15 sets six times per week. Instead, I suggest taking those sets and equally dividing them into six days instead of two. For example, if you train 15 sets of chest on Monday and 15 sets on Friday, you would now train only 5 sets per day, Monday through Saturday. These researchers took elite, resistance-trained athletes who were training every body part three times per week and broke their workload up over six days per week, with a lower volume per workout. Then they kept another group on the three-times-per-week program. By the end of the study, the elite lifters training each body part three times a week hit a plateau in gains. On the other hand, the lifters who trained six days per week were able to increase their quad size by 10 percent in a matter of weeks, and their strength skyrocketed! A 1994 study out of Finland supports these findings.3 Researchers looked at elite weightlifters who typically trained once per day. Due to their elite status, these athletes were in a frequent state of plateau. Researchers then took their training volume and split it up so they were now training twice per day on all workouts. So, if they usually performed 20 sets in the morning, they were now performing 10 sets in the morning and 10 at night. As with the Norway frequency study, this was enough to drastically overcome their plateau. 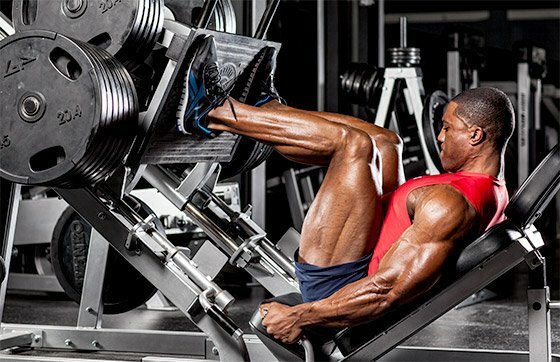 Let&apos;s say you normally perform 12 sets of legs for two workouts a week. To give your body a new stimulus, you could divide that into 6 daily sets spread over four workouts a week. Or if your volume is even greater, you can divide it equally between six workouts a week. Below is an example of how you might modify your training. Just remember: Your body can adapt to high-frequency training just like it did to low-frequency training. Once that happens, you can shock your system by compressing volume into fewer training days. The fact that your body is no longer accustomed to this stimulus may very well trigger protein synthesis for 24-48 hours the way it did back when you were a novice. Tang, J., Perco, J., Moore, D., Wilkinson, S., & Phillips, S. (2008). Resistance training alters the response of fed state mixed muscle protein synthesis in young men. AJP: Regulatory, Integrative and Comparative Physiology, 294(1), R172-R178. Hakkinen, K., & Kallinen, M. (1994). Distribution of strength training volume into one or two daily sessions and neuromuscular adaptations in female athletes. Electroencephalography and Clinical Neurophysiology, 34(2), 117-24. Lifters have been using eccentric-focused training as an overload technique for decades. But recent science has given greater insight into why this works, and how to make it work best. Here&apos;s what you need to know! Ask the Muscle Prof: Caloric restriction may be unavoidable if you&apos;re trying to lose weight, but that doesn&apos;t mean crash dieting is the only way. Use the latest research to your advantage and get lean the healthy way!